There is something exciting happening at The Royce in Pasadena. As the flagship restaurant at one of the oldest hotel establishments in the Los Angeles area, they are putting outÂ something so contrastingly nouveau from the kitchen. The long overdue remodel is no slouch, either, with its effortlessly classy and fresh take in fine dining ambiance. The crown moldings are still there, but gone are the drab curtains and dark yellow tinges. What you’ll find instead is a white motif accented by sea and granite blues with just enough florals and art museum-esque flourishes. 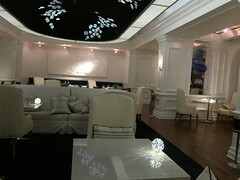 Finally, this dining room is creating a dining experience where the food is reflective of its backdrop. But make no mistake, Michael Voltaggio’s year-long run may have generated just the hype The Dining Room needed for its denoument and transition into The Royce, because The Royce is an entirely successful, new entity completely deserving of its own buzz under ExecutiveÂ Chef David Feau’s (Patina, Le Miravile, Lutece,Â trained under Guy Savoy) direction. My dinner took place a few months after he landed back in September, so it’s safe to say he’s settled in here. My guest and I very much enjoyed the tasting menu, with such beautifully integrated flavors adorning each dish and painting vibrant pictures with central themes. That is, each presentation, though featuringÂ pretty exotic ingredients,Â knew exactly when to stop. Sommelier Eric Espuny’s perfect wineÂ pairingsÂ delightfullyÂ accentuated the nuances of each. 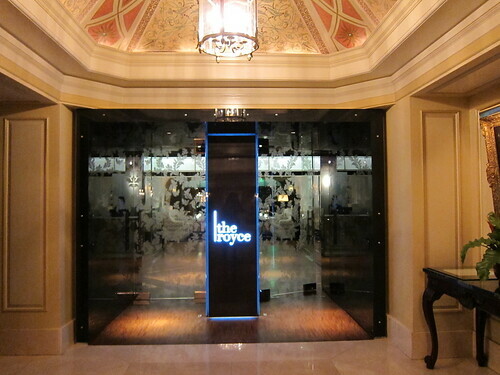 If you dine at The Royce, you can expect the perfect marriage of French techniques and Californian ingredients. I have to say that there was nary a weak component in our tasting experience. Before ordering, I convinced my guest to trust the chef and resist doubling up on the foie gras, steakÂ and lobster, and to try everything in both 5-course tasting menus. I’m so glad we did. Our amuse bouche was a most savory Romanesco cauliflower soup paired with a tiny piece of roast duck breast, beets, apple and celerac coconut calamari. What that set us up for was a beautifully seared scallop with shaved foie gras, rhubarb granite and carrot “salad” (paired with ’07 Schafer Frohlich Nahe Medium Dry Riesling) as well as an artichoke and beet dish with Globe Omaha artichokes, pressure cooked beets, hand harvested mache salad andÂ white truffle vinaigrette (paired with ’09 ChÃ¢teau Guiraud Le G Bordeaux Blanc Sec). The mildly tart rhubarb granite cut the richness of the scallop and foie gras while the carrot salad provided slices of sweetness. 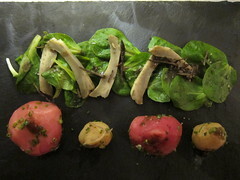 The freshness of the beet dish was a great match for the mache salad, featuring the buttery sweet and nutty greens underneath artichokes, all seasoned with a well-balanced white truffle vinaigrette. The next round of courses yielded a lobster salad with butter lettuce, sweet onion and pomegranate “hot and snow”Â (paired withÂ Â ’06 Domaine Leflaive Macon-Verze).Â The powdery, vaguely sweet snow was an interesting texture to add to the buttery shades of the lettuce and lobster – especially with the addition of the sweeter pomegranate seeds. 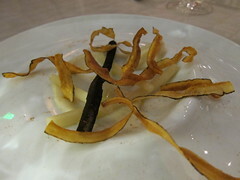 The salsify prepared four ways (paired withÂ ’98 Kalin Cellars Livermore Valley Semillon), however, was a provocative study of the root. Not only was the vegetable completely new to me, but the diverse ways it was prepared inÂ order to ultimately arrive on the same plate were mostly intense in flavor. The root has been described to taste like oysters. TheÂ dry, complex SemillonÂ wine paired with this was a great way to cut the salty, creamy and robustÂ essencesÂ on the plate. 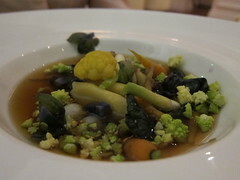 Probably my favorite farm fresh-themed dish was this combination of tiny vegetables covered in a mushroom veloute (paired with ’07 Aia Vecchia Lagone Toscana). The agnolotti were to die for, adding just the perfect amount of backbone to carry the vibrant flavors of the vegetables through, including the sweet parsnips and herb-likeness of the sorrel leaves. Truth be told, I could sip the veloute on its own. The berry notes of theÂ Aia Vecchia wereÂ a nice added touch.Â The black cod (paired with ’08 Ramey Chardonnay Russian River Valley) in the title pictureÂ was also a standout, having been perfectly cooked and its mild, fatty taste enabled to stand on its own. The kale greens were topped with a white dashi scented milk foam, an ingredient I couldn’t begin to dissect but could distinctly tell it was meant to bring the greens and fish together; it did so successfully. The carrotÂ was aÂ sweet go-between. The fruity Chardonnay the dish was paired with was a nice compliment to the fish and kale greens. One of the most popular dishes (not in the tasting menu but an addition) at The Royce could also double as dessert. At first, foie gras, when accompanied by huckleberry, struck me as a bit much – but when coupled with the bitter chocolate and chervil foam – it allÂ came together rather beautifully. It also occurred to me that huckleberries are not the sweetest berries out there, so bravo on this rich, sweet yet somewhat earthy combination. 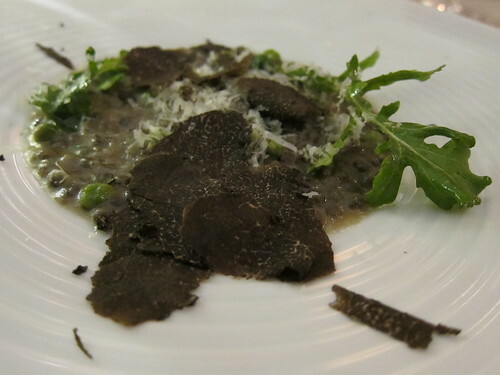 Another must-order is the lentils “du puy,” with English peas, roquette and topped with black winter truffles. It’s easy to see why this seasonal dish is often called “poor man’s caviar.” Each spoonful made me close my eyes. The sweetness from the peas was a nice accent to the richness of theÂ lentilsÂ while the truffles freshly shaven over the dish brought further depth. Each tasting menu ends with “Chocolate Textures,” which, while vague, shouldn’t be underestimated. Both renditions were dark, but perfect, ending punctuations to a perfect meal. I particularly liked mine, which was a mini chocolate souffle with a tulle connecting it and a scoop of nitrogen white whiskey sorbet for refreshment. 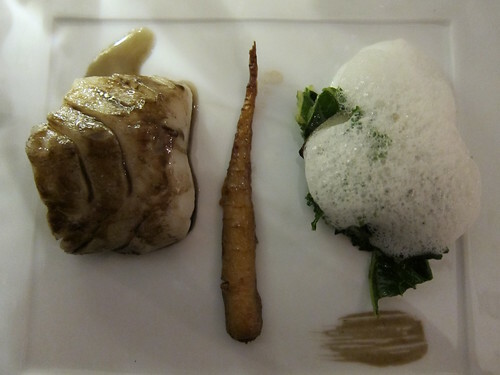 Practically every course in the tasting menu at The Royce brings a revelation. The kitchen seems to be a living, breathing enclave of inspiration. Case in point: When writing up this post, I found many dishes either omitted orÂ manipulated to become a completely different rendition than what I had had – andÂ only a week had passed. So the focus on market ingredients is not just a mantra, it’s an inherent rule to The Royce’s kitchen. 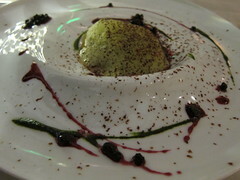 Chef David Feau does a superb job channeling that energy by executing exceptionally refined dishes. All food and wine were hosted. Extra special thanks to Akili for help with the courses. 1401 South Oak Knoll Ave. This entry was posted in Food, Pairings, Pasadena, wine and tagged California, chef, David Feau, dining, Eric Espuny, Food, L.A., pairings, Pasadena, sommelier, The Langham, The Royce, wine. Bookmark the permalink.